Physically, individuals should exhibit a square (though not broad) build, standing squarely and true over the feet. A deep and narrow chest allows the dog to more easily enter dens, and is preferred, while an excessively wide chest lessens this ability. Leg length is in proportion to the rest of the body, avoiding both stubbiness or legginess. The tail is set fairly high and straight, and is gaily carried. The tail posture, while the dog is working, will be wayward and is not important. Though cropped, the remaining tail must be long enough to serve as a handle, should the hunter need to pull the terrier from a den. The coat may be either harsh or smooth, the important factor for coats of working terriers being that the coat must be thick and ample for turning briars and fangs. All deviations from the standard that would affect the working ability of an earth dog are penalized in direct relation to their deviation. Scars, the result of honorable wounds, are not considered faults and are not to be penalized. This dog is highly intelligent and affable with its master an hunters. It has a determination to work, with combustible energy. Very people friendly. The German Hunt Terrier is bred to be a hunting and sporting dog. German Hunt Terriers possess a spirit of liveliness and speed at work, yet are regal at rest. 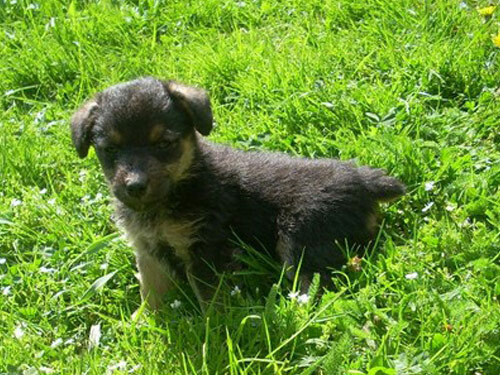 "Alert", "athletic" and "active" describes the ambience of the German Hunt Terrier. A bit of fire is always evident in its expression. A clever hunter, unrelenting robust and unafraid of the most formidable wild and very intent in the pursuit of such game. Dash, gameness and pluck are all descriptive of a properly bred German Hunt Terrier. The German Hunt Terrier, breds hunters over its existence, has maintained the fearless characteristics of early day den terriers. This breed can become willful and hard to manage without enough exercise and/or leadership. Not for the laid back type. They need a job to do. Proper human to canine communication is essential. This breed needs a great deal of exercise. When not out on the hunt they need to be taken on a daily long walk or jog where the dog is made to heel beside or behind the person holding the lead, as instinct tells a dog the leader leads the way, and that leader needs to be the human. They were bred to be hard working hunting and sporting dogs and need a job to do. Not for the laid back person. The German Hunt Terrier (German Jagdterrier, Deutscher Jagdterrier, Jagdterrier) is a comparatively young breed, having been developed only since the turn of the 20th century. The breed was developed in Germany as a functional hunting dog, and is used there on a wide variety of game, including wild boar, badger, fox and weasel. Imports into the United States and Canada have also been used by sportsmen as tree dogs, primarily for raccoon and squirrel.